The Lancaster City Council met for its Annual Meeting on Wednesday, January 10, 2018, at 7:00 p.m. in the City Hall Meeting Room. The following members were present: Olson, Bowlin, Hilman and Nordin. Sebenaler was absent. Chuck and Faye Potrament met with the council to discuss snow removal and asked that snow and ice not be placed in their yard. Olson will discuss the situation with snow removal person. Ned Webster with High Prairie Dairy met with the council to discuss the overdue water and sewer bill for the Apartments on Alaska Street that the previous managers have not paid. Council will contact city attorney regarding collection and determine what steps to take next. Council had discussion with the public present regarding contractor conflict of interest in regards to rehab grants. Council will get more information from Wynne Consulting regarding conflicts and procedures to handle these conflicts. Irene Wynne from Wynne Consulting was scheduled to be present but due to weather couldn’t attend. Nordin moved to approve the Council minutes of the December 13, 2017 regular meeting second by Bowlin and carried. A copy of the Minutes will be posted at the Lancaster City Hall and U.S. Post Office and available upon request to the clerk. The council reviewed the January 2018 bills presented this night; any other bills that have been paid prior to this meeting to avoid late payments, receive discounts & meet payroll and all payroll expenses as approved in the 2017 Rates Fees & Appointments Schedule. Hilman moved to approve the bills, second by Sebenaler and carried unanimously. An abstract of bills will be posted with the minutes and are available upon request to the clerk. Mayor – $70 per mtg. Council – $50 per mtg. Officials allowed to sign checks and Certificates of Deposits: Mayor, Mike Olson; Acting Mayor, Tom Sebenaler and Clerk, Carol Johnson with a minimum of 2 signatures required on each check. Health Insurance maximum paid for Employee Individual coverage $400.00 per month. Clerk has approval effective each January 1 with the passing of the rates & fees schedule to pay any bills necessary to avoid late payments, receive discounts & meet payroll and all payroll expenses. Mayor has approval to sign off on the Department of Public Safety Temporary license application on up to 4 Sunday Liquor Store events where on-sale liquor and food maybe sold (no off-sale liquor) without further council approval. $12.50/hr & JD Front Mount Mower $125/hr.-Min. 1 hr. NOT FOR GENERAL HIRE. ONLY IF CITY FORCED TO DO WORK. Insurance issues: The city does NOT waive the monetary limits on municipal tort liability established by MN Statute 466.04. Effective 1/1/18 Water Rates: Minimum 6000 gallons and less $60.00/quarter and $6.75/each 1000 gallons used above the minimum. Sewer Rates: (Based on gallons of water used) Minimum 6000 gallons & less $60.00/quarter and $6.25/each 1000 gallon of water used above the minimum. INDUSTRIAL PARK SPECIAL SEWER RATE: (if water usage exceeds 30k) sewer rate is $18.80/1000 on all usage above 30k. Bulk Water rates $9.35/1000 Gallon-minimum of 2000 Gal/$18.70--New account fee $35/Hookup fee $50.00. Meter Damages fees: $150.00 for inside water meter and $50 for outside meter reader. Insufficient Funds Check charges are $30.00/check and will be added to the customer’s water/sewer account. Interest rate on overdue accounts 10% per annum. Special Assessments: eff. 1/1/17: New Water Hookups $4,500.00, 20 yr. assessment with 5% interest per year & Effective 1/1/17 new Sewer Hookups $4,500.00, 20 yr. assessment with 5% interest per year. All Extensions will be reviewed by the council, and may at the council’s discretion be charged higher Water & Sewer hookup fees. EXTENSIONS CAN BE DENIED. NOTE: North Kittson Rural Water Special Assessments as applied to other city hookups also apply. Council reviewed and completed the 2018 Disclosure of Financial Interest by Public Official forms. The review of Chapter 178: Repeal of Regulation of Building Permits Ordinance and also Ordinance No. 1 that adopts the Minnesota Livable City Code was held as properly noticed. Hilman moved to adopt Chapter 178: Repeal of Regulation of Building Permits Ordinance, second by Nordin and carried. Clerk will publish. Nordin moved to Adopt Ordinance No. 1: An Ordinance enacting the Code of Ordinance for the City of Lancaster Minnesota, Adopting the Minnesota Livable City Code of Ordinances, 2016 Edition, Restating, Revising, Updating, Codifying and Compiling certain Ordinances of the City dealing with the subjects embraces in the Code of Ordinances, and providing Penalties for the violation of the Code of Ordinances, second by Hilman and carried. Clerk will Publish. Hilman moved to change the next regular council meeting to Wednesday, February 7, 2018 at 7:00PM from February 14, 2018 and have clerk post notice, second by Nordin and carried. Nordin moved to accept the $1,825.00 from Oneok Corporation (Viking Gas) for Fire Department turnout gear, second by Bowlin and carried. Council wishes to thank Oneok Corporation for supporting the Lancaster Fire Department. Clerk reports that Mike Whitlock has paid in full a loan from the revolving loan fund and requests that the city release the lien on the 2002 GMC Service Truck. The city has and equipment and vehicle lien for a second loan but Whitlock has purchased a new service truck that the 2nd lien will still be in place on. Bowlin moved to release the 2002 GMC Service Truck and allow Mayor to sign off, second by Hilman and carried. Hilman moved to approve Liquor Store Sunday on-sale applications for January 14, January 21 and February 4 in 2018, second by Bowlin and carried. Council discussed Hanson Manufacturing Revolving loans and tabled any action at this time. Council also reviewed the December 2017 City and Liquor Store financial information and year end information. Liquor Store cost of goods has increased and Hilman will discuss this with Liquor Store manager. Fire Chief requests that city get cost estimates for placing a fire hydrant on the east side of US Highway 59 near PodCo facility. Council will direct Zondagh to get quotes on this. 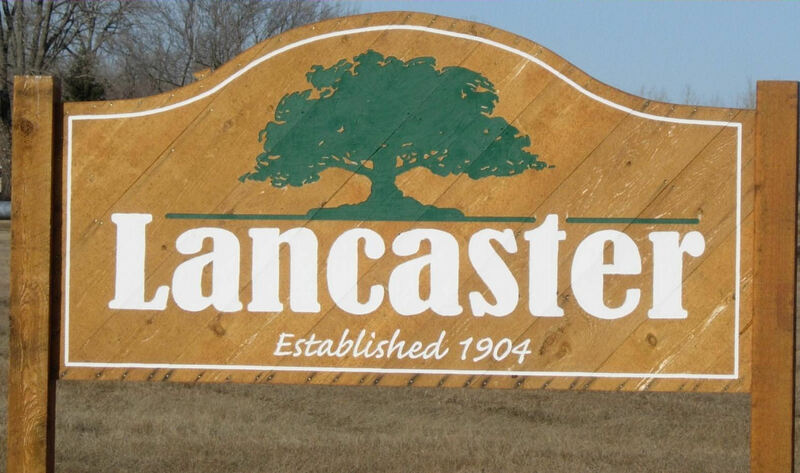 Joanie Farbo requests to purchase Lot 1 and 6; East ½ of Lot 2 and East ½ of Lot 5, Block 4 in the Lancaster Addition to Lancaster to build a new home upon. Council discussed that previous lots of this size in the addition have cost $1,000.00 plus Street Assessment and 2 North Kittson Rural Water Assessments. Bowlin moved to sell Lot 1 and 6; East ½ of Lot 2 and East ½ of Lot 5, Block 4 in the Lancaster Addition to Lancaster to Joanie Farbo for $1,000.00 with the city paying for the deed drafting and deed tax (no abstract will be provided); buyer to pay recording fees, second by Nordin and carried. Council discussed the loss of paint on the south legs of the water tower. Clerk will inform Maguire Iron the company that painted the tower in 2016 of the issue.